Participants of the Holy Land Tour expressed their delightfulness from the final day of the 2018 Holy Land Tour. Pastor Chris Oyakhilome– the founder of the renowned Christ Embassy Church has organized the final day of the 2018 Holy Tour as a “day to remember”. The week-ling visit to Israel was designed to play a crucial role in the spiritual success of the believers and followers of Pastor Chris and the Church. The trip was divided into four different groups, each accompanying the Pastor at crucial moments and sites. The Holy Land Tour aims to connect Christ believers with the Land of Jesus, expanding their understanding of the Bible and scripture, and thus connecting them to the Jewish land on a new level of faith. The entire tour was broadcasted and covered extensively by the news agencies, social media, and multiple streaming websites. The organization have thus declared the visit as “an overwhelming success”. The participants were then served at a traditional Lebanese restaurant in Jerash, Jordan. The group received a warm welcome and had the chance to try traditional food and drink. The Holy Land Tour provides the opportunity not only to connect to the scripture but also to experience the diverse culture of Middle East. The group went back to Israel by crossing the Allenby Bridge border. The Allenby Bridge, which is also known as the King Hussein Bridge connects the West Bank with Jordan and crosses the Jordan River. Other than through the West Bank, the bridge is currently the sole designated exit/entry point for West Bank Palestinians traveling in and out of the region. 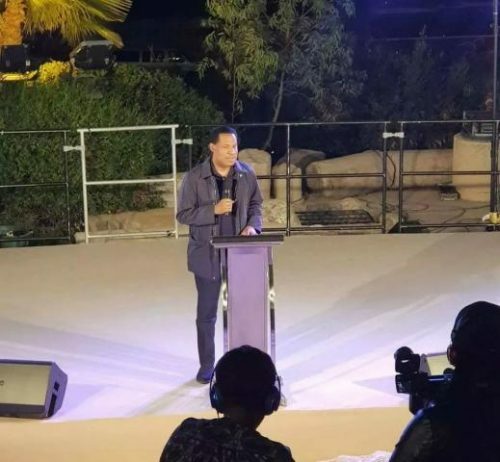 To wrap up the day and the Holy Land Tour itself, Pastor Chris Oyakhilome and Pastor Benny Hinn are prepared to host a charity gala at Olmaya Hall, Jerusalem. The event will feature a ministration from the Man of God, leading his followers closer to Jesus and their faith. Invited guests include local and international members of the Evangelical community as well as supporters from the Jewish community and fans of Pastor Chris Oyakhilome. The Jerusalem Orchestra will also be there. For more information, believers are encouraged to visit https://bit.ly/2I6BcRX and https://bit.ly/2rbI7UJ.